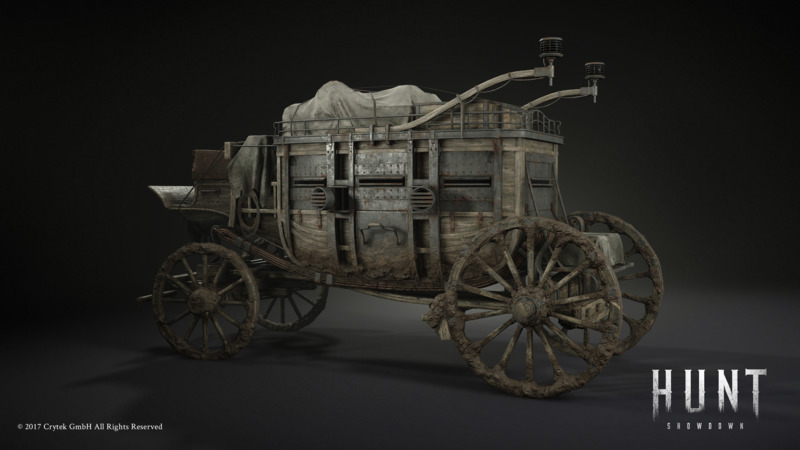 Today we’re giving you an overview on how we are working with Substance to create assets for Hunt: Showdown. Substance has become a crucial part of our workflow, so if you’d like to find out more about how we do what we do in the studio, read on. I’m Matthias Wagner and I’m a 3D Artist at Crytek in Frankfurt, Germany, working on props for our forthcoming game Hunt: Showdown. My passion for 3D began back in school over ten years ago. I discovered GMax and started working on custom assets for Warcraft 3 maps. I had always wanted to work in the games industry, and I got the chance when I applied for my first job at a company called Weltenbauer, where I worked on a couple of different projects including Construction Simulator. At the beginning, we were a very small team. Everybody had to do a little bit of everything and I got to work closely with the programmers. This was great, as I gained a lot of insight about the broader aspects of the game development process. Five years went by and I was ready to take the next step. I reworked my portfolio and applied for a 3D artist position at Crytek. I was delighted to get the job and started my new journey at Crytek in 2016. The first project I worked on was our VR game The Climb, which was also the first time I used Substance Painter. After that I worked on Robinson: The Journey and now Hunt. Substance is integrated into our workflow at Crytek. To give you an idea about how we use Substance, I’m going to talk about a specific asset which is the escape carriage that you can see above. In Hunt, you have to kill a monster and then escape. The escape carriage is one of the extraction points, and gives the player cover until they can make good on their escape. Our Concept Art department sent me a lot of great concept images and a concept art model to kick off the creation process. I also collected plenty of reference materials from late 19th century carriages and other research material. 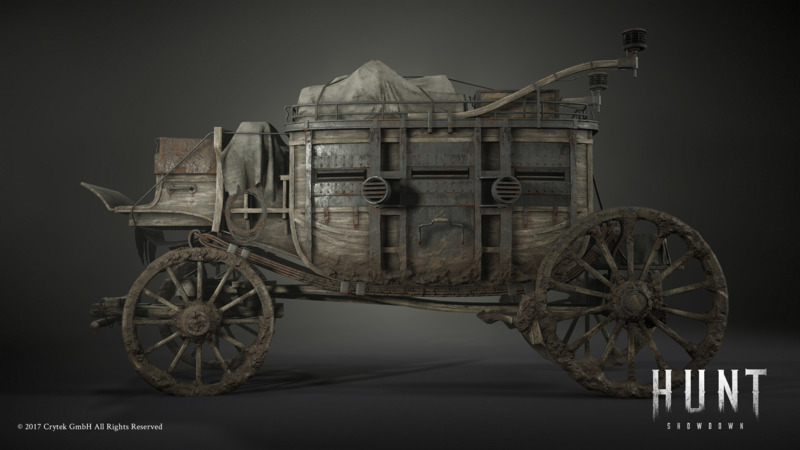 We wanted to capture the idea that the carriage has been involved in serious fights and had to battle through muddy, unfriendly terrain. Its body is reinforced with metal to protect it from the dangers that lie in wait for you in the swamp. The hunter has also packed everything they have collected in the mission on the top of the carriage. It’s basically a fortress on wheels. My goal was to achieve that muddy, dirty, and gritty look, but also stay true to the form and function of the asset. 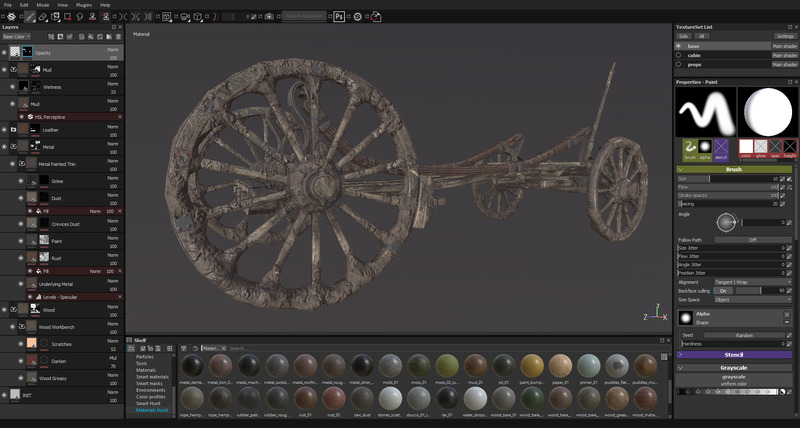 I had worked on some farming carriage assets before, so I knew the basic structure, which helped a lot. I used the concept art model as a base and started with 3ds Max and ZBrush. One thing I really wanted to add to the carriage was the mud in the wheels. I knew that I wanted to use our mud Substance material, which has already a lot of detail. Cheers to my colleague Alexander Asmus for his amazing substance materials! I took advantage of the object painting tool in Max and painted the mud as geometry on the wheels. After that, I took everything to ZBrush and dynameshed it. The result was an object with mid-frequency detail, which worked pretty well in combination with the mud Substance material. It also enabled me to quickly add some custom height detail to the mud, which would have been more difficult with a higher-frequency detailed normal map. 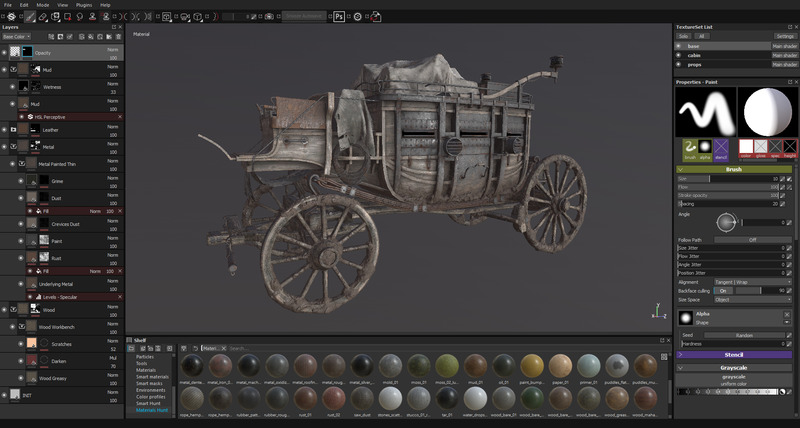 I was almost finished with my high-poly mesh when I received a request to add horses to the carriage. The horses had already been created by one of our talented character artists, Hugo Guerra. At this point, they were only planned as dead bodies in the level and the harness was still missing. It was good timing because I had not started baking yet. Substance Painter's re-import mesh function can be a real life-saver! I love to do as many steps as possible in one program, so I started baking my input maps in Substance Painter. This saved me a lot of time. I created groups based on the Material IDs and applied basic smart materials. 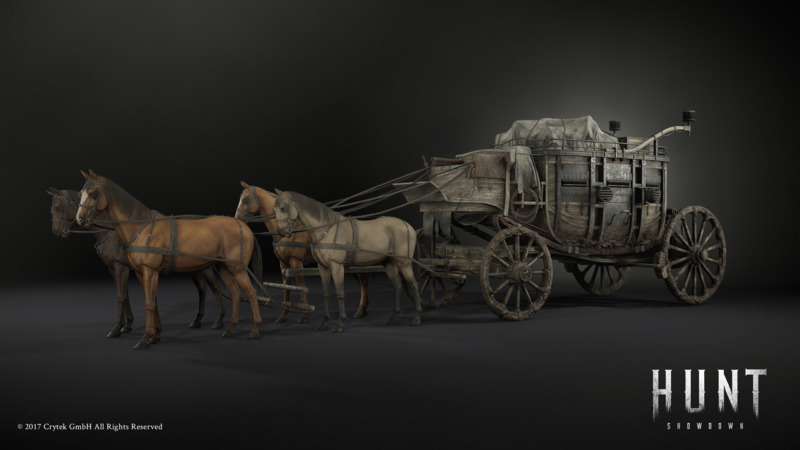 The carriage is built out of many different materials, like painted metal, wood, leather, and fabric. Organizing and naming everything is key - always think of the person who has to work with your files next! I tweaked every material until I was satisfied with the result. The last step was to add some unique textures and a paint layer on top to add that extra detail. For me, the use of smart materials is what makes Substance Painter really powerful. You bake a good Mat-ID map, throw a bunch of smart materials in the layer stack, and you are halfway there. Then you can massage the material a little bit more, add some unique dirt or rust, and the asset is pretty much done. Throughout the project, we used a library of different materials and smart materials. You can have, for example, a dusty wood material for interior assets and a moldy wood material for exterior assets in the swamp area. Both smart materials use the same wood material as a base. This is one of the biggest advantages of Substance Painter, because you can quickly iterate on the textures. If the art director comes along and wants to get five different texture variations, you can deliver that really quickly. The escape carriage has lots of different materials and the scene became quite dense over time. I stayed organized by labeling everything and organizing each part in folders. With our release of CRYENGINE 5.4, we added Substance integration to the engine, which is pretty awesome for environment artists. We also worked on streamlining the Substance Painter workflow. An asset in Substance Painter should look exactly as viewed in CRYENGINE. Therefore, we introduced a custom shader that has the same input maps as our illum shader. We also captured cubemaps from different light situations to get the same lighting as in our game scene. I would recommend that beginners build their own smart material library. Materials from Substance Share are a good base but you can also go far with fill materials and good masking. By doing so you get a pretty good understanding of materials and how they interact with another. You also get a library that you can reuse in future projects. I really enjoyed creating this asset and Substance really helps us deliver the quality that people have come to expect from Crytek games. We hope you found this insight useful. If you’d like to find out more about how we’ve used Substance at Crytek, you can check out an interview with Alexander Asmus, Senior 3D Artist. As ever, we’d love to hear your feedback and requests on the usual channels – the CRYENGINE forums, Facebook, and Twitter. Good break down of the asset. I love the way mud is being applied to the wheels. I'll try doing something similar for training purposes.